Help came to Newtown, Conn. Tuesday in the form of a dog. Or, rather, several of them. A group called Therapy Dogs International of New Jersey brought four of their four-legged friends to Sandy Hook Square to help people who might be feeling a lot of pain and emotion right now. The goal is to let grieving people pet animals and feel comforted by a pet who oozes unconditional love. The small city of 27,000 needs it: Four days ago, Adam Lanza stormed on the Sandy Hook Elementary School campus, killing 20 first graders, six adults, his mother and then himself in what is considered the nation's second-worst mass school killing in history. The worst, in terms of numbers, was at Virginia Tech, where 32 were killed. These New Jersey dogs are trained and have a lot of experience in helping people cope in traumatic situations. “It’s amazing when you see a child that’s sad…sit on the floor and talk to a dog,” Sister Mary Foley of the dog group told NBC Bay Area. This effort follows on the heels of other groups bringing in "therapy dogs," too. 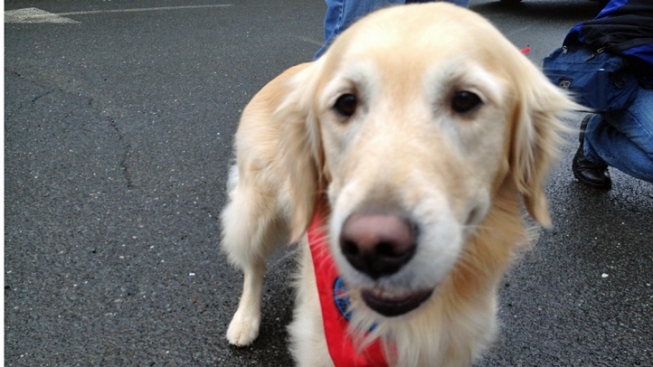 A Chicago church group brought ten trained Golden Retrievers to the town of Newtown. Some residents told NBC News that any little thing that can make someone smile - like a pet or a wag - is worth it in times of deep tragedy. View more videos at: http://nbcconnecticut.com.